Violence in society—and the workplace in particular—is on the upswing. The prevalence of active shooter incidents drives home the fact that preventing workplace violence must be a top priority of security and HR managers across all industries. In spite of the devastating effects of workplace violence, many employers don’t have effective violence prevention programs in place. 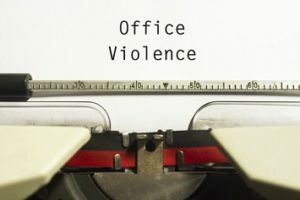 The U.S. Occupational Safety and Health Administration has indicated that it will be inspecting incidents of workplace violence and will use the General Duty Clause of the Occupational Safety and Health Act to cite employers if “recognized hazards” that led to or could lead to incidents of workplace violence are identified. Assigning responsibility for assessing existing and potential violence hazards and mitigating them. By failing to eliminate conditions that contribute to a foreseeable risk of violence, employers not only put their employees in jeopardy, but they also leave themselves exposed to potential legal liability. A person intent on committing a violent act often can defeat even well-conceived security measures. Consequently, a workplace violence policy should require HR or security personnel to prepare straightforward guidelines for employees on how to respond and handle violent situations. The guidelines should outline procedures for alerting security or the police and encourage employees to keep themselves out of danger rather than trying to physically restrain or remove a violent individual. A workplace violence policy also should provide support to employees who become victims of violence. Such support might include granting employees flexible leave from work or referring them to appropriate community resources, such as medical centers, counseling services, victim advocacy groups, legal aid, or domestic violence shelters. Liability to injured employees. Workers’ compensation usually provides employees an exclusive remedy for injuries sustained on the job, including injuries caused by on-the-job violence. However, under certain circumstances, some state workers’ compensation laws allow employees to sue their employer for injuries that were intentionally inflicted or due to the employer’s gross negligence. Foreseeable violence. An employee might be able to sue an employer for negligence if the employer failed to protect the employee or enforce its own security measures when violence was foreseeable. Example: An employee informs her employer than her ex-husband has threatened to come to the workplace and harm her. She brings pictures of her ex-husband to the employer. The employer promises to give the pictures to the security guard who monitors people entering and exiting the building, but the employer fails to do so. Under these circumstances, the employer might be held liable for negligently failing to protect the employee if the ex-husband were to enter the premises and assault the employee. Negligent hiring. In some states, courts have held employers liable for failing to conduct prehire background checks that might have revealed the violent tendencies of applicants who, when hired as employees, commit criminal or violent acts. In a number of these negligent hiring lawsuits, courts have awarded substantial monetary damages against employers for injuries to coworkers and third parties caused by an employee’s violent or criminal conduct. Sexual harassment. Employees who sustain physical or psychological injuries as a result of workplace sexual harassment have several legal options, including filing a complaint against their employer under civil rights laws or by filing a tort claim. In many jurisdictions, physical and psychological injuries sustained in connection with workplace sexual harassment are also compensable under workers’ compensation laws. In such cases, employers generally are unsuccessful in attempting to limit the employee’s remedy to workers’ compensation.